Wonder Woman #46, by writer James Robinson and artist Stephen Segovia, is the first part of The Dark Gods arc, and it’s...problematic. The previous arc, which pitted Wonder Woman and company against Darkseid, was plagued with plot holes and pacing issues that left a potentially great arc feeling like it was phoned-in. This issue starts off a little better, but it is showing early symptoms of the same ailments. First things first, the pacing of this issue is insane. It’s announced early on that Cheetah has somehow broken loose from confinement. Then, a time jump takes place, and she has been caught by Veronica Cale’s people in order to be experimented on. 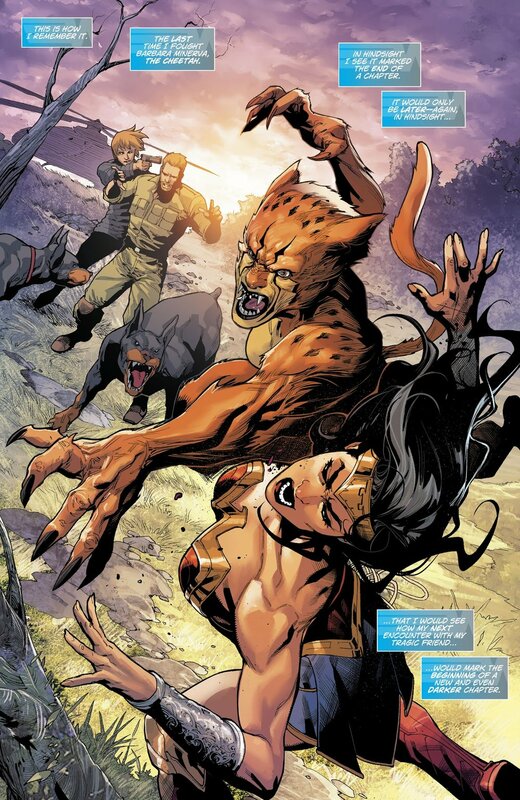 But that only lasts a page or two, because Cheetah immediately wakes up and goes on a rampage before she is stopped by Wonder Woman. This entire sequence feels like it should have taken two or three issues to tell, but instead, was shoehorned into half a book. It’s like Robinson has stopped caring about logical pacing altogether, and it doesn’t stop there. Suddenly, Jason (Wonder Woman’s brother) is breaking his adopted father out of a Kobra research facility, with no previous mention of Jason being worried about him being missing over the last arc. He’s just suddenly in danger and rescued within a few panels, without rhyme or reason. Again, there should have been seeds of this happening over the course of the last few issues, but Robinson only seems to care about getting all of his pieces in place for the story he wants to tell as fast as possible. The idea for this arc is fine enough, as people with deep religious beliefs seem to be sensing the coming of a previously unknown, new set of Gods, and it is causing them to lose their minds. Cheetah is the first to display this wild behavior, which sets up the major conflict for the issue when she tries to kill Cale. This is a fun idea and it’s a good way to explore the many different belief systems in the DC universe, which has several pantheons of “Gods,” but execution is everything, and Robinson is off to a shaky start. Thankfully, the ending of this issue shows tons of promise for an action-packed issue next time, so maybe Robinson has a better plan than he did last arc. The art by Stephen Segovia this issue is, without a doubt, the best thing about it. He is definitely born to draw Wonder Woman, and is especially skilled at drawing armor, which really sells the character of Jason and his mysteriously-gifted armor of the Gods. Segovia does seem to have trouble with Cheetah this issue, though, as she lacks detail in some panels, and just looks plain wonky in others. If he could just improve in that one aspect, Segovia might just be a perfect Wonder Woman artist. Romulo Fajardo Jr. also delivers amazingly on the colors in this issue. He’s not a super-flashy colorist, but compliments Segovia’s art well, and provides solid work that is pitch-perfect to the story. Overall, Robinson still has a lot of improvement to make in his handling of Wonder Woman. It’s frustrating to read his run on this book, because he is a proven, stellar writer, but it seems like he is just going through the motions, barely caring about taking time to craft a good story. All of the ingredients for a classic run are there, but he just keeps missing the mark. With the promising ending of this issue, there is still time to save it, but it’s not likely Robinson’s run as a whole will be remembered fondly by anybody.